Non-powered and medium value assets aren’t always high profile compared to heavy construction equipment or cargo containers. Yet, these tools, equipment and containers are vital for completing projects and orders. It is important to have an updated inventory list whether an item is in the storage yard, in transit or on the work site. Knowing the location, accessibility and availability of the asset saves time and money. IoT technology assists in raising the visibility of these types of assets, optimizing utilization and, as Gideon Hillman Consulting said, providing “proof of accountability for damage or loss”, in the event of theft or if misuse occurs. Unauthorized use and theft of assets are also a risk. While the total dollar amount of the asset may not be significant, there is a ripple effect of costs and risks for potential for injury while searching for the asset as well as having to replace a lost or stolen piece of equipment. Another smaller yet important consideration is the environmental impact of equipment and tools abandoned or lost. Your business may operate under various specific regulations for cleanup or disposal that could incur cleanup costs or fines. These issues impact your productivity and bottom line. IoT supply chain technology is enabling the monitoring of a wide variety of assets or equipment as they are transported from the storage yard to jobs sites or various high-risk areas as they move along their journey. Having this information in real-time, along with historical records, allows companies to make important operational decisions and improve business processes through improved asset utilization, while reducing loss potential. The data allows you to spot problem areas and opportunities as well as provides ways to improve your operations. Yet, how does it work? The solution is a combination of Bluetooth sensor tags paired with a transmitting telematics gateway, like CalAmp’s Asset Management, Visibility and Theft Solutions, to detect an asset’s proximity in the storage yard and jobsite. The data helps enable the detection and location tracking of designated shipments, non-powered assets or medium-value equipment, such as pumps, generators, hoists, ladders and tools. It will save managers and staff hours of looking for and relocating misplaced assets. This is doubly important if a truck driver falls under the FMCSA’s Hours of Service regulations. Extra time in the yard takes up valuable minutes of drive time if the rig is waiting for a misplaced load. If employees, jobs or customers have assets assigned on a temporary basis, companies have live inventory information that minimizes the risk of loss, unauthorized use or theft. 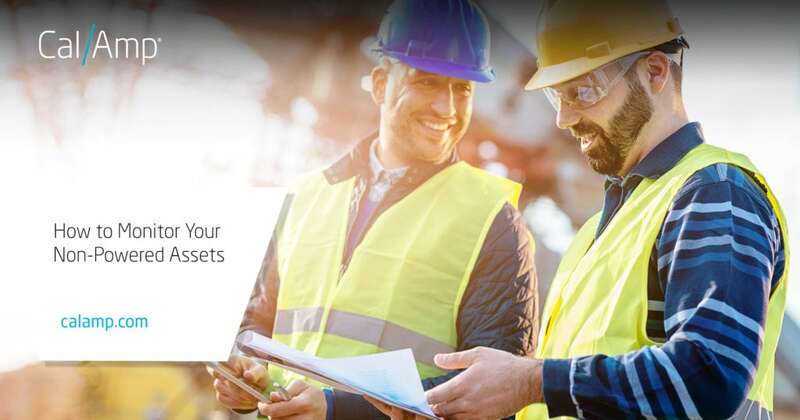 The real-time event notifications let managers and staff know when an asset leaves or returns to a specified area such as the yard, a staging area or a jobsite. These alerts help with yard, inventory and site management. The information also facilitates in asset recovery in case of theft. The CalAmp solution also offers recovery assistance through its command center when using the SC1004 solution. Implementation of IoT sensors lets you focus on the task instead of asking where is my generator, power drill or pallet. Location information paired with proximity alerts and breadcrumb details streamlines operations whether you are shipping or renting assets, or managing projects. The information often integrates into other back office systems, which helps reduce shipping and maintenance costs.